I repeated the linkbench tests described in a previous post for TokuMX 2.0.1. This uses MongoDB, LinkbenchX and different storage engines. The test server has 144 GB of RAM, 6 SAS disks with HW RAID 0 and 24 hyperthread cores. The benchmark was run with 12 concurrent clients. The first test is with a cached database. The test pattern is to load the database and then do 12 1-hour query tests in a loop. The database always fit in RAM. At the end of the 12th hour the database size was 40 GB for WiredTiger, 22 GB for RocksDB, 30 GB for TokuMX and 78 GB for mmapv1. I used Snappy compression for WiredTiger/RocksDB and QuickLZ for TokuMX. The graph below has the average QPS per 1-hour interval. I then looked at the output from the 12th 1-hour run to understand why QPS was much better for WiredTiger. The table below has the average response time in milliseconds for the 3 most frequent operations. WiredTiger has the best times, mmapv1 has the worst times for writes (per database or per collection writes are single threaded) and TokuMX has the worst time for get_links_list. The get_links_list operation requires a short range query. The test was repeated with a database that does not fit in RAM. The test was not run for mmapv1 because I didn't have enough disk space or patience to wait for the load to finish. At the end of the 12th hour the database size was 728 GB for WiredTiger, 632 GB for RocksDB and 588 GB for TokuMX. It is interesting that the TokuMX database was smaller than RocksDB here but larger than RocksDB for the cached test. I then looked at the output from the 12th 1-hour run to understand why QPS was much better for TokuMX. The table below has the average response time in milliseconds for the 3 most frequent operations. TokuMX has is faster on get_links_list while RocksDB is faster on add/update link and the get_links_list operation is done about 5 times per add/update. WiredTiger is the slowest on all of the operations. TokuMX is the most IO efficient for this workload based on the data below. That explains why it sustains the highest QPS because disk IO is the bottleneck. I used data from iostat (r/s, w/s, rKB/s and wKB/s) and divided those rates by the average QPS with all data taken from the 12th 1-hour run. I assume that disk reads done by queries dominate reads done from compaction. 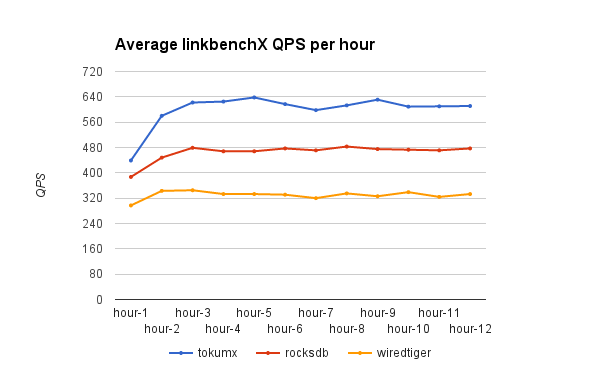 TokuMX does less IO per query than RocksDB and WiredTiger. 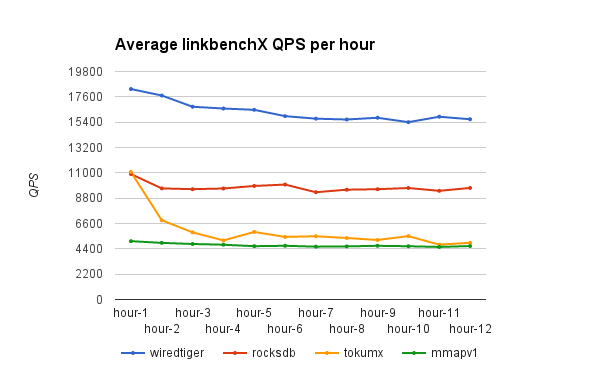 Both TokuMX and RocksDB write much less data per query than WiredTiger. This has a few more details on the MongoDB configuration I used. The oplog was enabled for all engines. This is the configuration file and startup script for TokuMX. The block cache was ~70G for all engines. What is the impact from the RAID stripe size? That depends on the workload. Many years ago there was an excellent paper from Oracle with the title Optimal Storage Configuration Made Easy. It is still worth reading today. One of the points in the paper is that you don't want individual storage read requests to use more than one disk for workloads with high concurrency to reduce the number of disk seeks. RocksDB is used for OLTP and supports workloads with high concurrency from user requests and from compaction done in the background. There might be 8 threads doing compaction on a busy server and a typical compaction step done by a thread is to read from ~11 SST files and then write ~11 SST files. While each SST file is read sequentially, all of the files are read at the same time. The SST files are written in sequence. So we have ~12 streams of IO per compaction thread (11 for reads, 1 for write) and with 8 compaction threads then we can have ~96 streams of concurrent IO. The reads are done a block at a time (for example 16kb) and depend on file system readahead to get larger requests and reduce seeks. The write requests are likely to be large because the files are multi-MB and fsync is called when all of the data to the file has been written or optionally when sync_file_range is called after every N MB of writes. Even if we limit our focus to writes there is a lot of concurrency as there is likely 1 write stream in progress for each compaction thread and another for the WAL. The reads done by compaction are interesting because many of them will get data from the OS filesystem cache. When level style compaction is used, the small levels near the top of the LSM are likely to be in cache while the largest level is not. Enough about RocksDB, this post is supposed to be about the performance impact from RAID stripe sizes. I ran a simple IO performance test on two servers that were identical except for the RAID stripe size. Both had 15 disks with HW RAID 0, one used a 256KB stripe and the other a 1MB stripe. While the disk array is ~55TB I ran tests limited to the first 10TB and used the raw device. Domas provided the test client and it was run for 1 to 128 threads doing 1MB random reads. The array with a 1MB stripe gets more throughput when there are at least 2 threads doing reads. At high concurrency the array with a 1MB stripe gets almost 2X more throughput. linktable has a primary key index on (link_type, id1, id2) and a secondary index on (id1, link_type, visibility, time, id2, version, data). The secondary index is covering for the most frequent query. While it almost doubles the size of linktable it also greatly reduces the worst-case random IO required for that query from a few thousand to a few. This can be a good tradeoff even when using PCIe flash. I have described 6 indexes but claimed that 9 were used. The other 3 are used for WiredTiger and RocksDB but not for mmapv1 and are indexes on DiskLoc (key is DiskLoc, value is the document). for each collection. While WiredTiger and RocksDB support a clustered primary key that is not supported (yet) in MongoDB because the storage engine API is still evolving from what was needed for mmapv1. With mmapv1 the base table is heap organized and the value in a primary key index is a DiskLoc which I assume is a filename and offset where the document resides. WiredTiger and RocksDB are copy-on-write and the location for a document will change one or more times after an update so they can't use DiskLoc to point to the one place on disk where the document exists, thus they need the extra index. Server-14569 and server-15354 are open for this. If we get proper support for a clustered primary key index, then MongoDB would use 6 indexes for Linkbench versus 4 for MySQL. How do we reduce that from 6 to 4? The unique secondary indexes for the link and count collections are not needed in MySQL. The problem here is that MongoDB doesn't support a composite PK. One workaround is to concatenate the fields (link_type | id1 | id2 -> _id for the link collection, (id | link_type -> _id) for the count collection. I don't recommend that because it must be done by the client, and done correctly, on every insert and update. It is even more work to make the concatenated value order preserving, which is easy in code, but makes it harder to construct the _id value when manually querying the database. This also means that some fields will be stored multiple times: once in the _id field, once separately. This has results for Linkbench with MongoDB and a server with a disk array. The Linkbench configurations are similar to the tests done for cached and uncached databases, but the server here uses a disk array with 6 10K RPM SAS disks and HW RAID 0. The previous tests used PCIe flash. The server with a disk array has 24 hyperthread cores and is at least one generation older than the PCIe flash server which has 40 hyperthread cores. Both have 144G RAM. The test client is LinkbenchX and the configuration is described in a previous post. The test used 10 threads for loading and 20 for queries. After loading there were 12 1-hour runs of the query test and results are reported for the 2nd and 12th hour. The results below are for the test with maxid1=20M set in FBWorkload.properties for both servers (disk array, PCIe flash from a previous post). The load rate is similar between the servers with a disk array and PCIe flash. The query rate is better for the server with PCIe flash, but that might be due more to more cores and newer CPUs than to storage performance. The load and query rates are better for WiredTiger than for RocksDB on both servers. The server names are explained in a previous post. The oplog was enabled for all tests. The results below are for the test with maxid1=1B for both servers (disk array, PCIe flash from a previous post). The load rate is similar between disk and flash and is also similar to the rates above for the cached database. Multiple secondary indexes are maintained during the load but IO latency does not have a significant impact on the load rate, even for WiredTiger which does more random IO than RocksDB. The query rates are significantly lower for the disk array than for PCIe flash. IO latency is significant for queries. However, RocksDB does better than WiredTiger on the disk array possibly because it uses less random IO for writes which leaves more random IO capacity to serve reads. Update - I repeated tests for the disk-array server with different configurations and the results are better. For WiredTiger I set storage.syncPeriodSecs=600 which changes the default checkpoint interval from 60 to 600 seconds. The benefit should be fewer disk writes and QPS improved by more than 30% with that change. For RocksDB I used the default configuration and QPS improved by more than 20% compared to the non-default configuration I had been using (Igor did a good job choosing the defaults). For all engines I used a smaller block cache -- 32G rather than 70G -- to save more space for compressed blocks in the OS filesystem cache. Results for all engines improved with a smaller block cache. 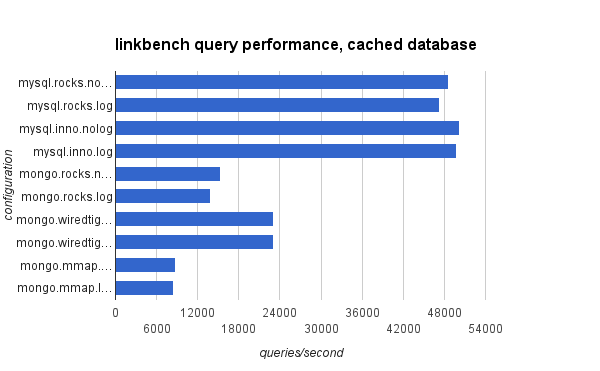 This has the mean response time in milliseconds for each of the query types in Linkbench. The data below is from the 12th 1-hour run for the disk array (the first pair of numbers) and then PCIe flash (the second pair of numbers. The most frequent operation is GET_LINKS_LIST followed by MULTIGET_LINK. On the disk array because the response time for these two operations is better for RocksDB and that explains why it gets more QPS than WiredTiger. For PCIe flash the response time for GET_LINKS_LIST is lower for WiredTiger which explains the better QPS. The response time for all of the write operations is better for RocksDB than WiredTiger on disk and flash, but those operations are less frequent. WiredTiger does more reads from disk & flash during writes as b-tree leaf pages must be read before being written. The QPS for RocksDB is higher than WiredTiger for the 2nd 1-hour run with the PCIe server but lower after the 12th 1-hour run. The mean response time for the GET_LINKS_LIST operation almost doubles and the cause might be the range read penalty from an LSM. And the data below is example output from the end of one test, RocksDB on flash for the 12 1-hour run. 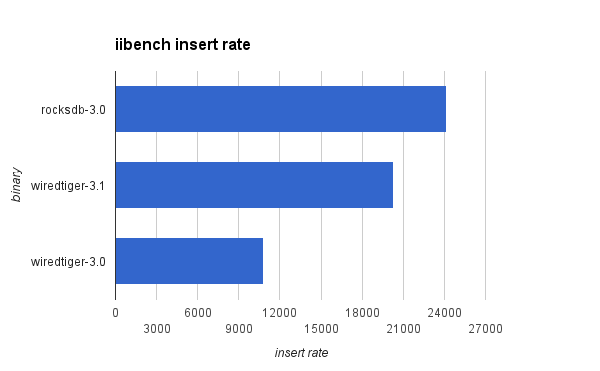 This has results for Linkbench where the database is much larger than RAM. I previously shared results for a database that can be cached in RAM. I used Linkbench for MySQL and LinkbenchX for MongoDB as described in the Configuration section in a previous post. The value of maxid1 was set to 1,000,000,001 in the FBWorkload.properties file. For the cached database test that was set to 20,000,001. The test server has 144G of RAM, 40 hyperthread cores and PCIe flash. The tests were configured to use 10 threads for loading and 20 threads for queries. I disabled the binlog during the load for MySQL and enabled it during the query tests. The oplog was always enabled for MongoDB. the load rates are similar to the rates for the cached database and IO when the database is larger than RAM doesn't have a big impact on performance. But this might depend on fast storage and these results are for a server with PCIe flash. relative to the query rates for the cached database, RocksDB suffers the least and WiredTiger suffers the most when the database is larger than RAM. the size for RocksDB was similar between MySQL and MongoDB for the cached database. That is not the case here as MongoRocks uses almost 1.7X more space than MyRocks. I have yet to debug this. For MongoRocks all data is stored in one column family. For MyRocks I used one column family per index and if nothing else this makes it easy to determine how much space and IO is consumed per index. There are also more optimizations in MyRocks to remove tombstones earlier but the space difference shows up immediately during the load and there shouldn't be tombstones at that point. MongoDB also uses more indexes than MySQL (9 vs 4) for Linkbench and that might be the reason but this is still a mystery. I restarted MySQL after the load test to enable the binlog prior to the query tests. InnoDB was configured to use direct IO so I lost the contents of the buffer pool during the restart. Performance suffered for the early query tests until the buffer pool warmed up and that includes the 2h test I reported above. 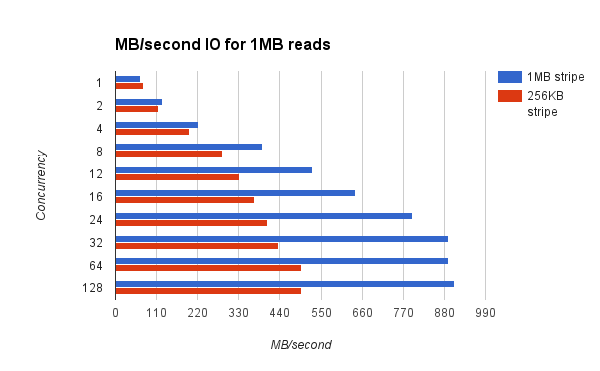 This explains why QPS was better for the 12h and 24h results with InnoDB. Buffered IO is used for MySQL+RocksDB so less data is lost during a restart (block cache must be warmed up but OS filesystem cache is not wiped). The table below shows the ratio of the rates from this test with the rates for the cached database. The goal is to determine how much performance degrades when the database is larger than RAM. The ratio is expressed as a percentage and 50% means that the rate for the uncached database was 50% of the rate for the cached database. Note that the load rates are close to 100% for RocksDB while InnoDB degrades a bit and WiredTiger degrades more. This is expected from a write-optimized algorithm like RocksDB and b-trees like InnoDB and WiredTiger. The results for 2h for InnoDB are less accurate because mysqld was restarted as described in the previous section. For the 24h results MySQL degrades less than MongoDB and RocksDB degrades less than b-trees (WiredTiger & InnoDB). There has been progress in the 3.1 branch on performance bugs I reported for the WiredTiger B-Tree so I repeated the insert benchmark for it and the improvements are great. The average insert and query rates for WiredTiger are almost 2X better in 3.1 versus 3.0. RocksDB still does better than WiredTiger for inserts but worse for queries. I tested 3 binaries: WiredTiger via MongoDB 3.0.x, RocksDB via MongoDB 3.0.x and WiredTiger via MongoDB 3.1.5. I use "3.0.x" because the build is from a special branch used for MongoRocks development. The test is run with 10 loader threads and 1 query thread. The test HW has 40 hyperthread cores, PCIe flash storage and 144G of RAM. The database is much larger than RAM at test end. The insert rate is faster for RocksDB because it is write-optimized and benefits from not doing read-before-write during secondary index maintenance. It also benefits from a better cache hit rate because the database is smaller than for WiredTiger. The queries are short, 10 document, range scans on a secondary index. WiredTiger does better than RocksDB because a write-optimized algorithm like RocksDB trades read for write performance and there is more work to be done on range scans. The read penalty is less for point queries. Nslow - the number of write operations that take at least two seconds. This is computed from the slow operations reported in the log. The charts display the insert and query rates for each binary. The hardware and configuration I use is described in a previous post. I used my fork of iibench and am glad that Tim wrote and shared the code. I used this command line to run iibench and load 500M documents with 10 loader threads and 1 query thread. 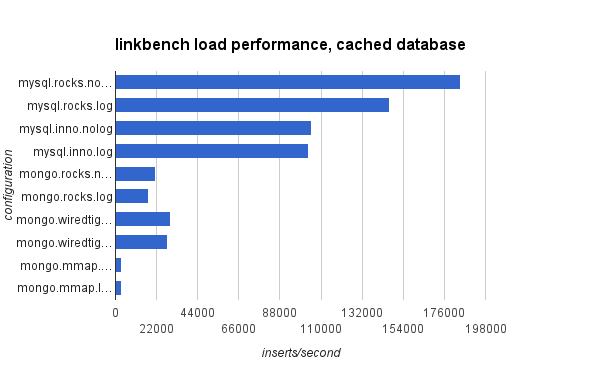 I have been using Linkbench and LinkbenchX to compare performance for MySQL and MongoDB. Previous results were shared for a cached database and a small server. Here I describe the impact of a long-running transaction on QPS for InnoDB and RocksDB storage engines in MySQL. The summary is that a long-running transaction caused a big drop in QPS for InnoDB and RocksDB. The long-running transaction was created by executing BEGIN and then a short running SELECT statement in one session. After the SELECT statement completed the session remained open while a 1-hour linkbench test was run. If you take logical backups from an active database server, then you care about the performance impact from a long-running transaction. The InnoDB result surprised me as I didn't expect the drop to be that large. The test used repeatable read for InnoDB and a long-running transaction in this case means there is a long-open snapshot that blocks purge and the history list length grows during this test which also means that the disk space for undo grows. RocksDB also uses a snapshot per transaction so a long-running transaction should imply a long-open snapshot. Read the section on Gets, Iterators and Snapshots to understand the difference between snapshots and iterators in RocksDB. Both of them prevent some old data from being removed from the database, kind of like InnoDB purge. But RocksDB is more clever than InnoDB about dropping old data so we don't have a pending feature request like 74919. But a long-running transaction still means that queries encounter more tombstones which means more overhead. 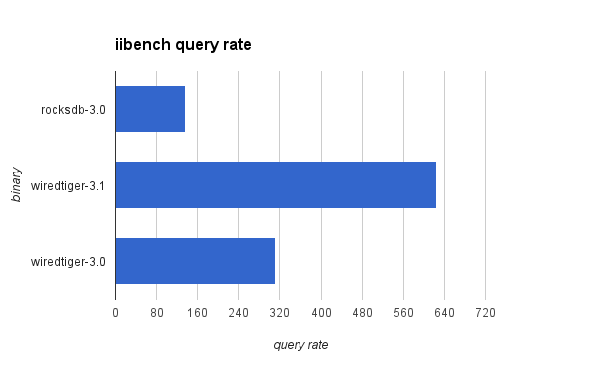 This shows linkbench QPS from 3 1-hour runs for MySQL+InnoDB and MySQL+RocksDB. The first and third 1-hour runs are done without a long-running transaction. 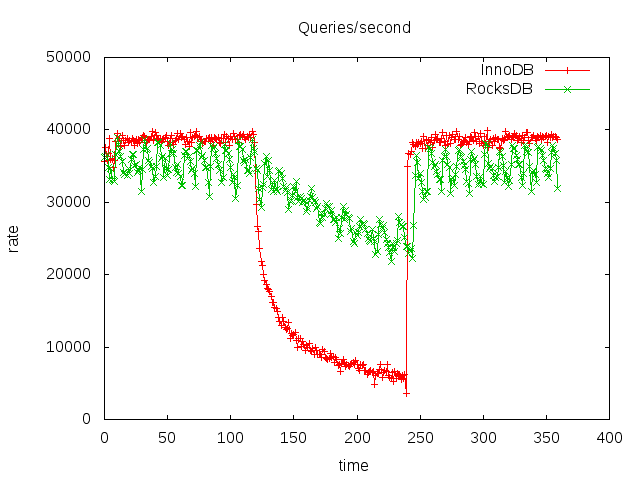 The middle 1-hour run is done with a long-running transaction and QPS for InnoDB drops quickly and for RocksDB drops less quickly. Fortunately it recovers as soon as the long-running transaction is closed. The tests used the cached database configuration (maxid1=20M) as described in a previous post and were done after ~12 1-hour linkbench query tests had already been completed. There are 8 types of statements used by linkbench. By far the most frequent is GET_LINKS_LIST which is handled by doing a short range scan on a secondary index for the MySQL implementation. That is also the statement type most impacted by the long-running transaction as the average response time increased by ~1.5X for RocksDB and ~7X for InnoDB. I previously reported results for Linkbench and LinkbenchX running on high-end commodity servers. Here I report results for much lower-end hardware. I have two Intel NUC systems with 8G of RAM, 1 disk and 1 SSD. They are small, quiet and were easy to setup. There is an active NUC community hosted by Intel with useful answers to many questions. I managed to get the systems running without asking for help from Domas. That is rare. The tests here were run with the database on the single disk. The oplog was enabled for the test but sync-on-commit was disabled. Tests were done with maxid1=2M for the cached database and maxid1=20m for the uncached database. Unfortunately the database was always not cached for mmapv1 because it uses so much more space for the same data compared to WiredTiger and RocksDB. The QPS for RocksDB is a lot better than WiredTiger in the cached database test. After looking at the iostat data from the test I see that WiredTiger didn't cache the database for the 12h result below. The WiredTiger database was 5G, the test server has 8G of RAM and the WiredTiger block cache gets 4G of RAM. Assuming the database compressed by 2X then the uncompressed database is 10G, the 4G block cache can store 40% of it and the OS filesystem cache gets at most 4G. From vmstat data I see that the memory.cache column grows to ~4G. Sizing a cache for InnoDB with direct IO is easy. Give it as much memory as possible and hope that the background tasks that share the HW don't use too much memory. But then InnoDB supported compression and now we had a problem of figuring out how to share the InnoDB buffer pool between compressed and uncompressed pages. There is some clever code in InnoDB that tries to figure this out based on whether a workload is CPU or IO bound. Well, we have the same problem with WiredTiger and RocksDB. Because they use buffered IO the OS filesystem cache is the cache for compressed pages and the WiredTiger/RocksDB block cache is the cache for uncompressed pages. Neither WiredTiger or RocksDB has code yet to dynamically adjust the amount of memory used for compressed versus uncompressed pages but I am certain that it is easier to dynamically resize the block cache in them compared to InnoDB. For now RocksDB and WiredTiger default to using 50% of system RAM for the block cache. I suspect that in many cases, like when the database is larger than RAM, that it is better to use much less than 50% of system RAM for their block caches. I will save my hand waving math for another post and will leave myself a note to repeat the tests below with the cache set to use 20% of RAM.